The Avengers—and all of their friends and enemies—have united. At least, the actors who portray them have. The group of over 80 actors came together in October to celebrate the the 10-year anniversary of the MCU, and the upcoming release of Avengers: Infinity War, which will hit theaters on May 4. Iron Man star and O.G. 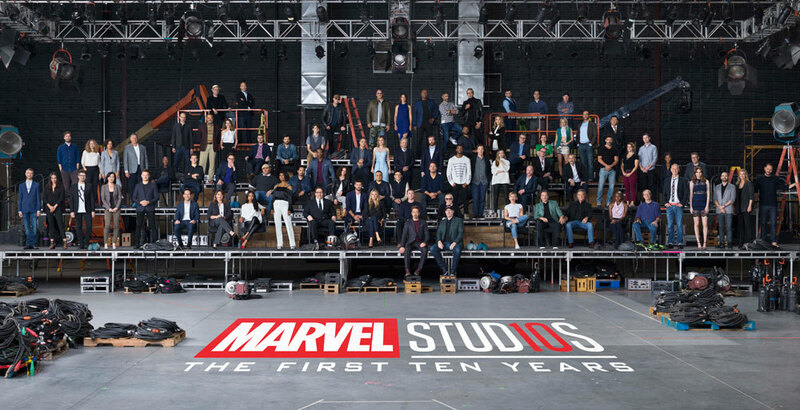 onscreen MCU hero Robert Downey Jr. is front and center of the photo, while his fellow Avengers—Chris Hemsworth (Thor), Mark Ruffalo (Hulk), Scarlett Johansson (Black Widow), Jeremy Renner (Hawkeye), and Chris Evans (Captain America)—are sprinkled throughout the group. Actors: Robert Downey Jr., Chris Evans, Chris Hemsworth, Mark Ruffalo, Scarlett Johansson, Paul Rudd, Benedict Cumberbatch, Chris Pratt, Chadwick Boseman, Brie Larson, Jeremy Renner, Tom Holland, Sean Gunn, Hannah John-Kamen, Zoe Saldana, Angela Bassett, Jon Favreau, William Hurt, Karen Gillan, Emily VanCamp, Tessa Thompson, Don Cheadle, Dave Bautista, Michael Peña, Anthony Mackie, Evangeline Lilly, Elizabeth Olsen, Paul Bettany, Frank Grillo, Letitia Wright, Laurence Fishburne, Linda Cardellini, Sebastian Stan, Ty Simpkins, Michael Douglas, Michelle Pfeiffer, Hayley Atwell, Pom Klementieff, Benedict Wong, Michael Rooker, Vin Diesel, Cobie Smulders, Gwyneth Paltrow, Kurt Russell, Danai Gurira, Samuel L. Jackson and Jeff Goldblum.